This script not only makes it possible, but easy to plot 2D scatter or line plots in GrADS using user specified arrays. That is, there is no requirement than an outside file be open, and the 'display' command is not needed or used. Now, for most things, it is probably easier to use matlab, python, idl or even excel to do graphs like these. However, I can certainly see the advantages of this script if you are accessing large data sets right through the NOMADS data server, or the GrADS data server. 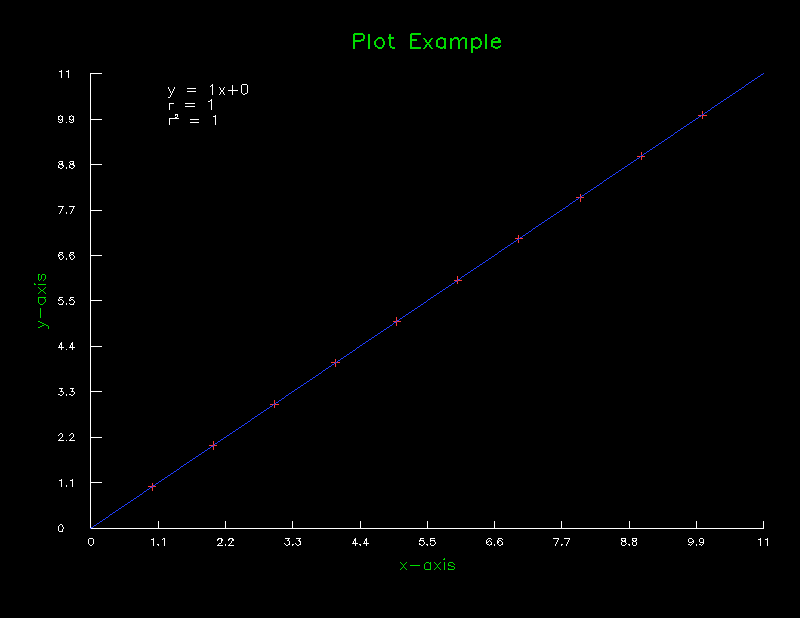 Depending on the options used, your plot will look similar to the one below. Note: you must include both the -x and -y to specify your arrays, and your arrays must take a form similar to the ones listed above. There are numerous options to customize your plot, they are listed in the script under "default options at the top." Additionally, most of these options can be set manually when calling the function. 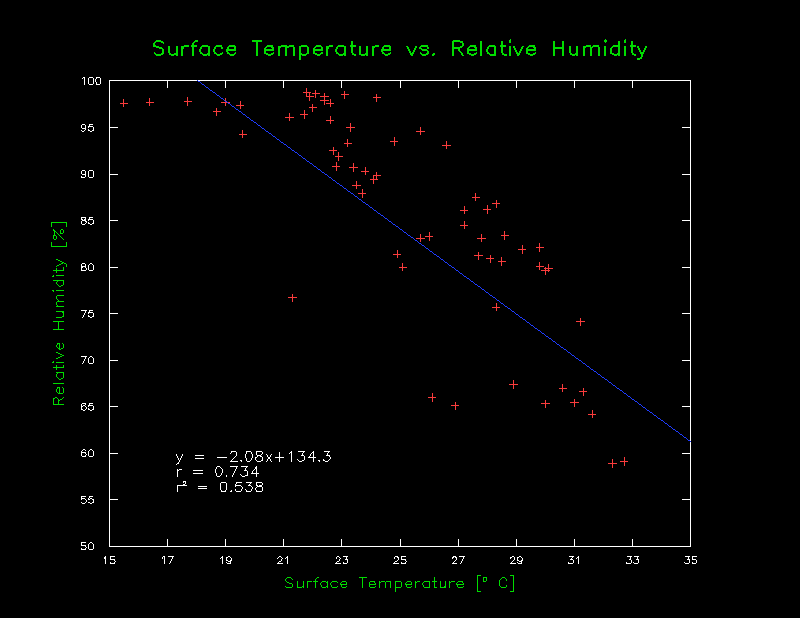 The main example I will show here, is basically, taking the time-series surface temperature and the surface RH at a given point, and then making a scatter plot of the two variables. Once the file is open, we clear the screen and pick a point and then set gxout to print, since are are just going to populate our arrays with numbers. Now, we need to start populating our arrays! This isn't too hard we just set our initial arrays = '' (blank), and then loop through all time steps (65 for GFS) and concatenate as we go, being sure to leave a space between each new array variable. So, as you can probably see, this call uses several of the options available in the script. -box: Draws box around plot, instead of two axis as shown in Fig.1. This will plot something similar to the plot below. You will be prompted in the script to place the equation, and type in the titles (unless you have default titles set). This plot appears more or less as you might expect, RH is inversely proportional to temperature (Think Clausius), and while this relationship isn't physically linear, you still get a decent correlation here. Remember, You will be prompted to place the equation and your titles, so be sure to read the console as you work with this script! Lastly, there are several options that exert varying degrees of control over your plot (just a few are listed above), including number of ticks on each axis, font/symbol/line color and style, labels, etc., etc., So be sure to bring up the help page to get an idea of how to set different options. Most of the time, this type of analysis is best left to matlab, or something, if you are used to GrADS, this might cut out having to save data to an outside file just to do this. Who knows, hopefully you all find it useful! Remember, this is version 1.0, so bugs are certainly possible, if not likely, please report them here! HI there, I was studying the precipitation over the coast in Peru and found that the sea temperature over the Pacific ecuatorial basin and the precipitation have an exponencial distribution in 30 year-period of time used for the study so, I would like to know if there's possible to use some script or function that let me draw this distribution spacially, like your example. I hope you could help with it. Thanks in advance. I unfortunately do not have any scripts put together that try to do anything beyond simple linear regression ... that sounds like a bit too much math for me. However, if it is an exponential relationship, you could always try taking the natural log of one of your variables. This would be make your exponential relationship linear. Hi, I am trying to plot azimuthally averaged vertical structure of a cyclone. I read the parameter value at every individual point, calculate the azimuthal average and write to a text file along with the co-ordinates(radius,height). This text file is read in matlab and plotted(shaded plot with x-axes depicting radial distance and Y-axes depicting height). Is there a way to do this in grads itself ? could you please help me in this regard. You have not included two arrays. For help type: "scatter -help"
I have two variables in my control file: temperature and precipitation for 45 time steps. Thank you for the earlier reply. Can you please tell me how to change the color and shape of the scatter marks ? I am trying to plot different datasets in one plot. It would be easier to use different color of scatter marks and regression line. Where in the script do I include these command ? For example, in the above code where do I insert the options ? When I try to plot the regression line without min and max values for the x and y axes t is fine. However, when I try to plot the regression line, with the min and max axes values, as suggested by you (see below), the regression line gets plotted outside of the box. How do I get the line inside the box ?